Lighten up with these incredible vegan tacos. 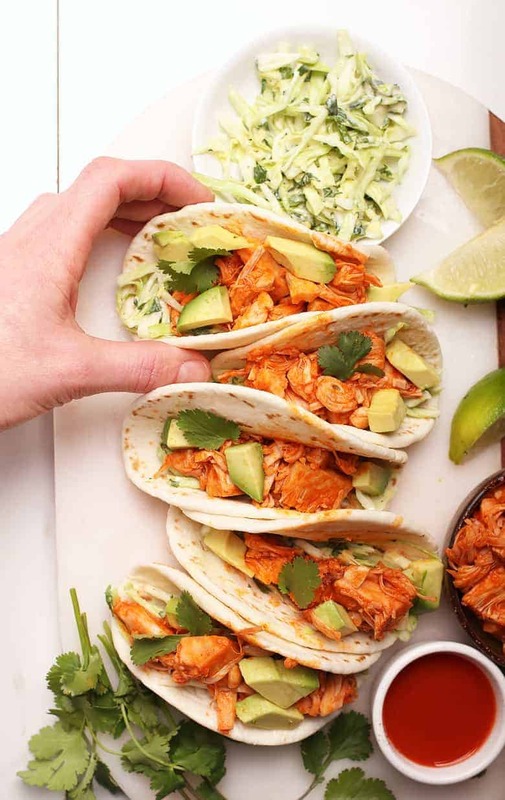 Made with buffalo jackfruit, cilantro cabbage slaw, and fresh avocado, these tacos are something to get excited about! Made in just 20 minutes for an easy and delicious vegan meal. It’s Vegan Taco Time, my friends! Over the 7 years that I’ve been blogging, I have very few taco recipes on the blog. In fact, I only have two (besides this one). And of the two, one of them is also a jackfruit taco recipe – BBQ Jackfruit with Mango Salsa. When I made these vegan tacos with Buffalo Jackfruit I wasn’t considering the fact that I haven’t branched out beyond jackfruit tacos much, but the truth is, jackfruit is just one of the best vegan taco fillings out there and buffalo jackfruit is AMAZING. 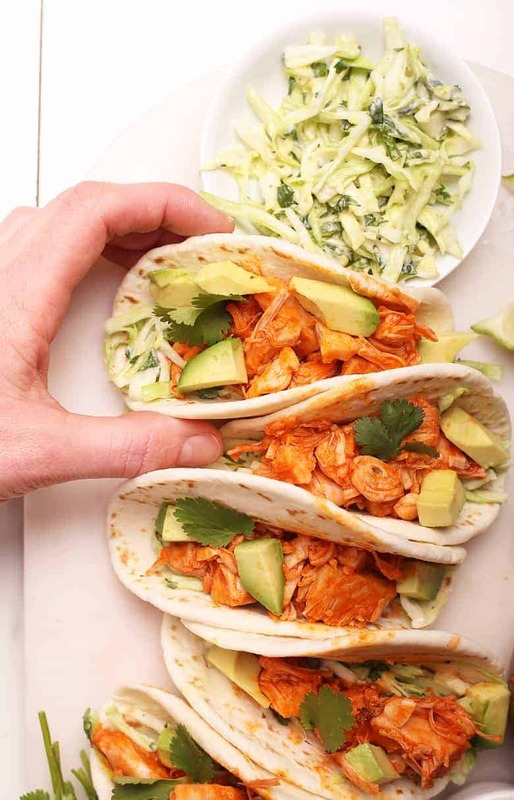 Jackfruit and Buffalo Sauce combine in this sweet and spicy way that, mixed with Creamy Cilantro Slaw, makes the perfect sweet and creamy, spicy and tangy combination. I rarely eat what I make these days (it mostly goes to my family) but friends, I ate FAR to many of these vegan tacos. I just couldn’t help myself! Have you cooked with jackfruit yet? Every time that I do I have a renewed appreciating for this exotic fruit. For those of you who are unfamiliar, jackfruit is a large green tropical fruit that, when green, has very little flavor. The stringy texture, however, is similar to that of chicken or pulled pork, making it one of the most popular whole food vegan meat substitutes. While some people buy jackfruit whole, I find getting it canned is the most convenient way to introduce jackfruit into your recipes. Drain and rinse the fruit. Pat in dry with a kitchen towel. When buying in a can, jackfruit comes in small triangles. At the base of the triangle, you’ll find a thick core. To shred it, hold the core between your thumb and forefinger and gently press up while pressing into the fruit with your thumb. The tops will easily shred into what you see below. Watch this video to see it for yourself. Jackfruit is an incredible whole-food meat substitute. It has a similar texture to that of chicken or pulled pork and it takes on any flavors you give it. It does especially well with slightly sweet flavors (like BBQ) or super spicy flavors (like Buffalo). 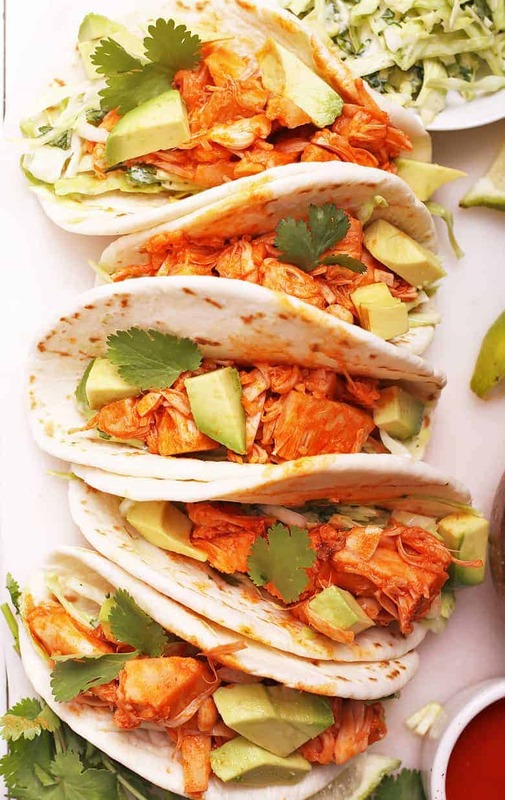 To make the buffalo jackfruit for these jackfruit tacos, we must make the Buffalo Sauce. Next, drain and rinse the jackfruit. 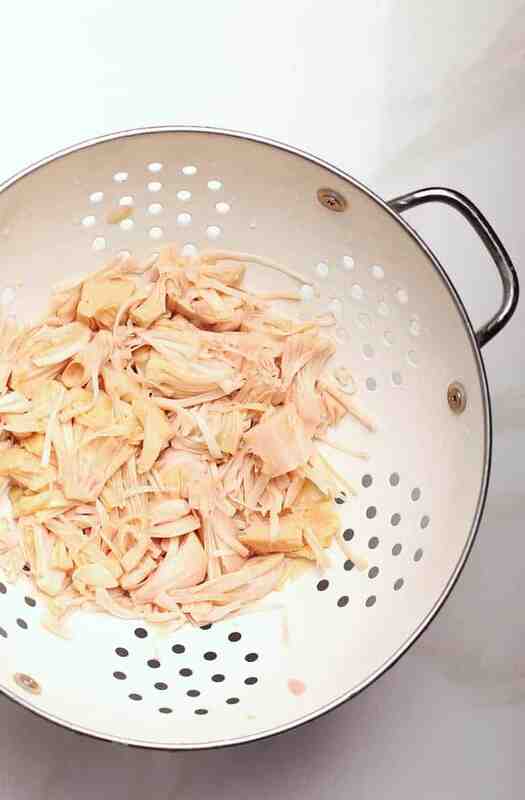 Rinse the jackfruit through a colander to get off any of the brine flavors from the can. Pat the jackfruit dry with a paper towel. 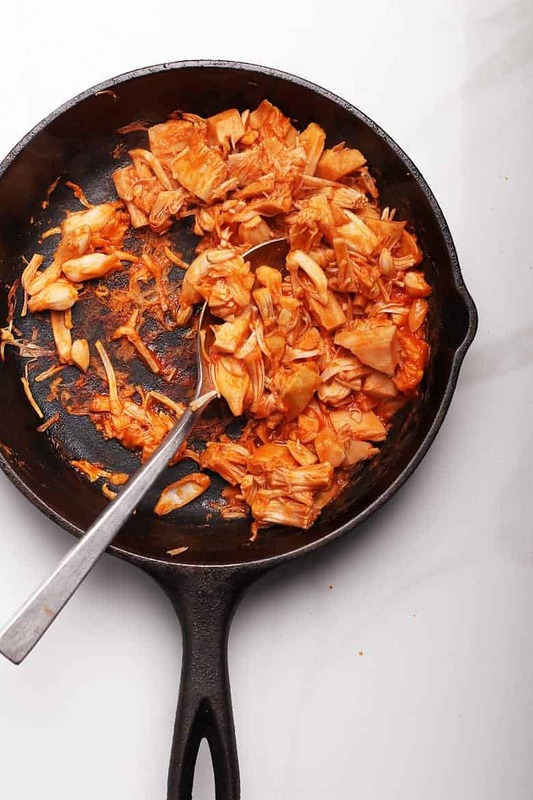 While the jackfruit is drying, heat up oil in a cast iron skillet. When it is sizzling hot, add the jackfruit and sauté for 3-4 minutes until the jackfruit begins to brown. 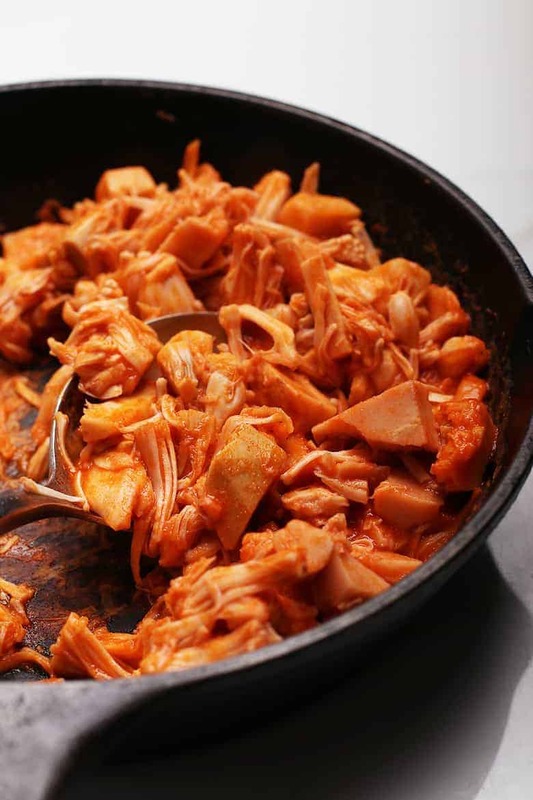 Remove the jackfruit from heat, stir in the Buffalo Sauce and you’re ready to go! How to make Vegan Cabbage Slaw? There are a lot of vegan mayo options now available at the store. However, if you want a slightly more healthy option, this vegan slaw can be made with my oil-free avocado mayo instead. To make the slaw, thinly cut the white cabbage into small pieces. You can also use the shredding attachment of your food processor but no need. Transfer the shredded cabbage into a bowl and stir in the remaining ingredients. Taste and adjust according to your liking and refrigerate until ready to use. Now that we have our buffalo jackfruit and creamy cilantro slaw made, it’s time to assemble the tacos. To assemble, place a small scoop of slaw on the bottom of each tortilla. Add about 1/4 of buffalo jackfruit and top with avocado, fresh lime juice, and cilantro. 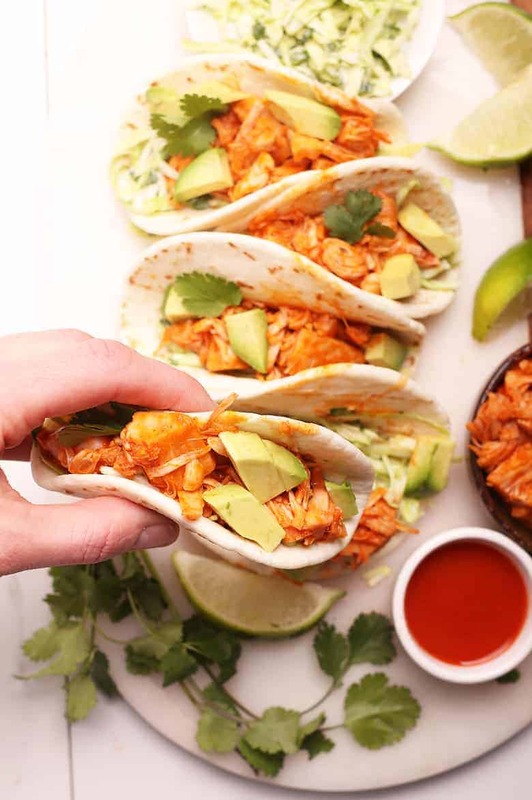 Can these Buffalo Jackfruit Tacos be gluten-free? Sure! Just swap out the flour tortillas for corn tortillas and you have yourself some vegan and gluten-free buffalo tacos! Once assembled, these vegan tacos should be eaten immediately. However, leftovers can be stored separately. The Creamy Cilantro Slaw can be stored in an airtight container in the refrigerator for up to 5 days. Store the Buffalo Jackfruit in the refrigerator for up to 3 days. When ready to eat, gently reheat the jackfruit in the microwave or over the stovetop. Serve these tacos as part of your Cinco de Mayo meals or summertime potlucks. But before you run off and check those out, let’s take a look at these Vegan Tacos with Buffalo Jackfruit. Drain and rinse the jackfruit through a colander. Shake out any excess water. Lay the jackfruit on a paper towel and pat dry. Using your fingers, press the jackfruit chunks and the base to fan out, pushing it into large shreds. See this video for a visual. Set aside. 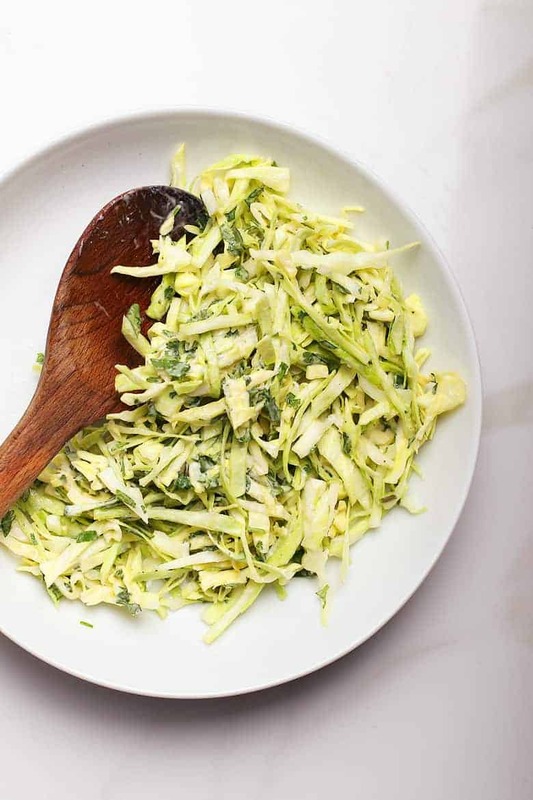 To make the Cilantro Cabbage Slaw, finely chop the cabbage and place it in a mixing bowl. Add minced cilantro, lime juice, salt, and vegan mayonnaise. Taste to adjust seasonings. Refrigerate until ready to use. In a saucepan combine Frank's Red Hot, vegan butter, and white vinegar. Heat, stirring occasionally until butter has melted. Remove from heat and set aside. In a skillet, heat avocado oil (or any high-heat oil) over medium heat. Add the jackfruit and sauté for 3-4 minutes, stirring frequently, until the jackfruit has begun to brown on the edges. Remove from heat and stir in the Buffalo Sauce to fully coat the jackfruit. To assemble the tacos, place 2-3 tablespoons of cabbage slaw at the bottom of each taco. Top with buffalo jackfruit, cubed avocado, fresh lime, and cilantro. Serve immediately.